Mexico capitalized on the initial upset against Germany to stay at the very top of the Group F standings beating Korea Republic 2-1 on Saturday afternoon. They now need a single point in the last match against Sweden to secure the top spot finish in the group, while a defeat would seriously complicate the situation likely leaving three sides with six points at the end of the campaign. Mexico maintained the perfect record beating South Korea 2-1 on Saturday. A draw here would keep El Tri at the top of the standings in Group F, regardless of the outcome in the other game. Ola Toivonen had a dismal campaign for Toulouse in Ligue 1, but he earned a place in the starting lineup here with a beautiful goal over Manuel Neuer. Juan Carlos Osorio has reasons to be thrilled after another strong performance his attacking line offered at the World Cup. German’s conqueror Hirving Lozano enjoyed another stellar display, providing a key assist against the Koreans. Chicharito managed to find the back of the net for the landmark 50th time in the Mexican shirt and he also became only the third Mexican to score at three different editions of the World Cup (after Cuauhtémoc Blanco and Rafael Marquez). Finally, Carlos Vela entirely enjoyed his free role in the final third providing a fantastic all-round display after confidently converting the penalty-kick in the first half. Next up for the Mexicans are Sweden who confirmed the tag of a super stern defensive outfit against the reigning champions Germany on the same day. However, Janne Andersson’s men were unlucky to lose the match at the end, conceding the last-gasp stoppage time stunner from Real Madrid’s Toni Kroos. Their campaign is all but over, though, as the victory here gives them a chance to progress into the last 16 round, depending on the outcome of the Germany vs Korea clash as well as the goal difference. Juan Carlos Osorio had no reasons to change anything from the clash which saw off the defending champions Germany. He only replaced Hugo Ayala on the right back, introducing Edson Alvarez to the squad against Korea Republic. No significant changes are expected to be seen on Wednesday against Sweden. 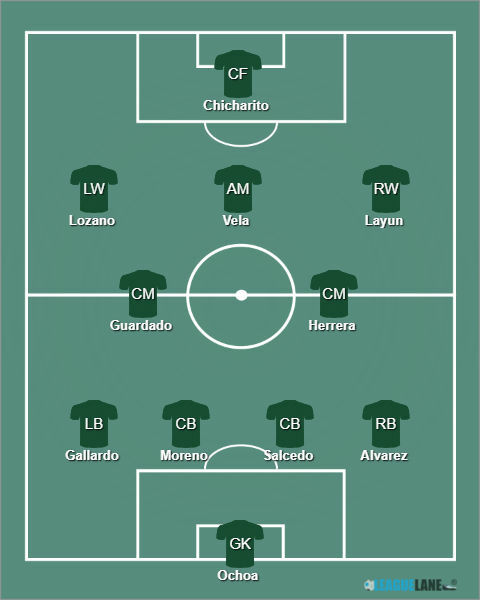 Ochoa – Alvarez, Salcedo, Moreno, Gallardo – Herrera, Guardado – Layun, Vela, Lozano – Chicharito. Janne Andersson does not quite have width in his ranks to change the starting XI frequently. The return of Manchester United’s center-back Victor Lindelof (recovered from injury) was the only change to the side that defeated Korea Republic. We can thus expect the same 4-4-2 formation in the following set-up for the Swedes. 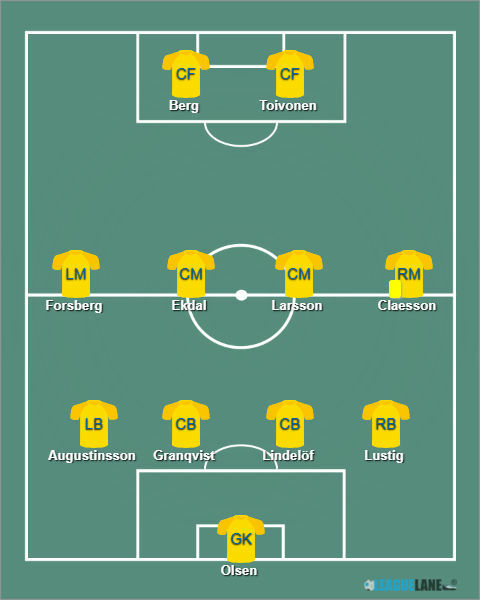 Olsen – Lustig, Lindelöf, Granqvist, Augustinsson – Claesson, Larsson, Ekdal, Forsberg – Toivonen, Berg. 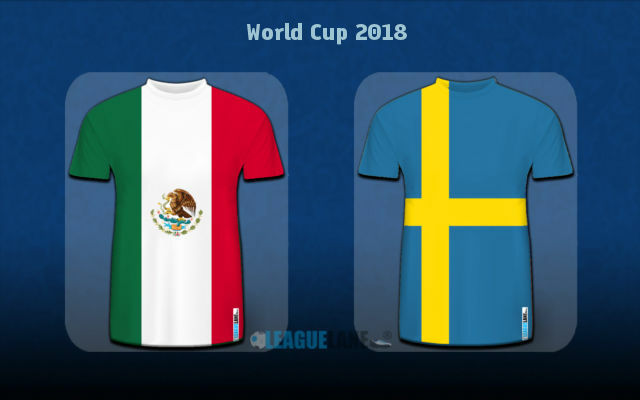 Sweden and Mexico took on each other only once at World Cups in the past. The clash happened back in 1958 when Sweden took a comprehensive 3-0 victory on the home soil. Teams locked horns on three more occasions later on, each time in matches of a friendly character. Mexicans won a friendly in 1994 (2-1), the clash from 2005 saw a goalless draw, while the Scandinavian outfit clinched a 0-1 victory in 2009. Even though it’s Sweden who need three points here, we doubt Janne Andersson will change his defensive-minded approach against an outfit such as Mexico. The El Tri possess a host of creative players capable of hurting any defense out there moving forward and a bliss from either Carlos Vela, Andres Guardado, Hirving Lozano or Javier Hernandez could well make the difference here. Sweden have a less talented side in the final third which is why they should sit at the back and try and strike from counter-attacks, just as they did against Germany on Saturday. Before the encounter with Die Mannschaft, Sweden kept three subsequent clean sheets which only confirms their defensive capabilities. We believe the Scandinavians have what it takes to keep things tight at the back in the first 45 minutes, meaning we’ll back a goalless first half at 2.50 odds. Value-seekers will fancy a draw at the half time and a win for Mexico at the end at 5.50 as we expect the Swedes to go for the win late on in the second half, leaving up space for deadly Mexican counters. Predicted Full-Time Result is a victory for Mexico in a very nervous contest. Under 0.5 goals in the first half @ 2.72. Correct FT Score: 2-0 Mexico @ 11.50.